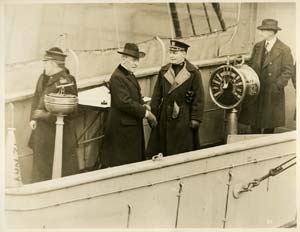 Woodrow Wilson and Edward McCauley Jr. on the bridge of the U.S.S. George Washington. 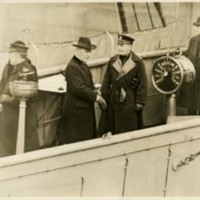 “Woodrow Wilson and Edward McCauley Jr. on the Bridge of the USS George Washington,” 1918, 000000595_0032, University of Virginia Woodrow Wilson Photographs, Woodrow Wilson Presidential Library & Museum, Staunton, Virginia.